It's August again! It feels like it was May yesterday, and I was getting ready to go to SICM and move to Plano. I've spent all summer long trying to prepare for this Fall. I've met lots of UTD girls, and we finally have our corefa pairs decided and peer teams set up. I'm ready for the year to begin! We just had our Corefa Prep weekend, and we're about to head into our Welcome Week. For those of you who don't know what those things are I'll explain. At the beginning of every school year, we get all of our core leaders together in order to prep them for the year and Welcome Week. We build in some community and team building games as well to try to quickly form some bonds. Welcome Week is something the school puts on. Starting August 17th students will be moving in and events will begin and go until September 3rd, the school puts on events for all of the new and returning students to go to. We use this time as a huge outreach opportunity. New freshman, transfer, and international students have stepped on campus and are looking to make friends! We want as many of our students and staff out on campus trying to cast their nets wide, inviting as many students as possible to hangout, go to their cores, and join FOCUS. I'd like to ask for lots of prayer. I'd like to ask that you be praying during this time that our students are bold and persistent in meeting new people and inviting them to things, that they meet other students and professors in their classes, and that the hearts of the students stepping onto campus would be receptive to Jesus! I can't wait to write back in September with some cool stories about what happens during this time! 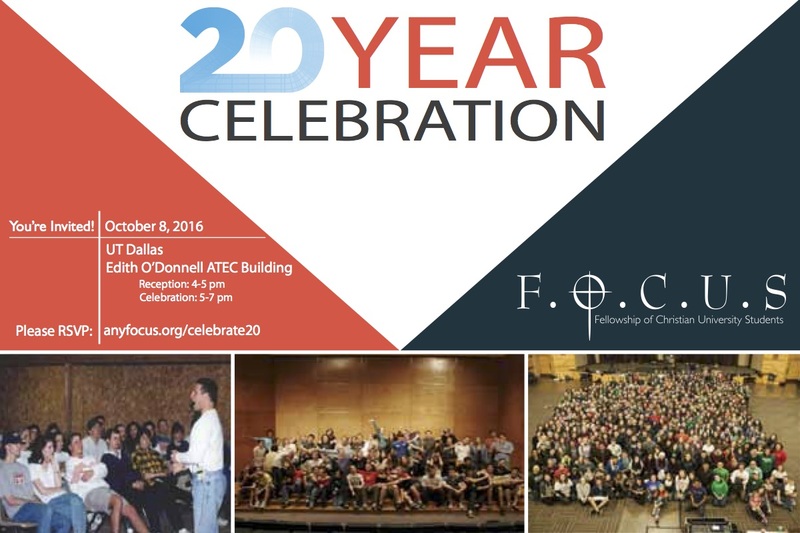 Another thing I'd like to invite you to join in on is celebrating all that God has done in the first 20 years of FOCUS on October 8! 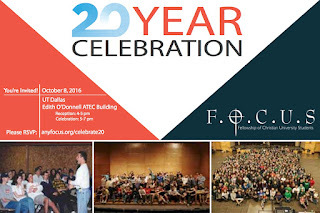 I think it's going to be an incredibly fun and encouraging event, and I'd really encourage you to come if you can. Spouses, children, family, and friends are all welcome. Thanks so much guys for all of your support, and I'm looking so forward to another year building God's kingdom on these campuses with you!